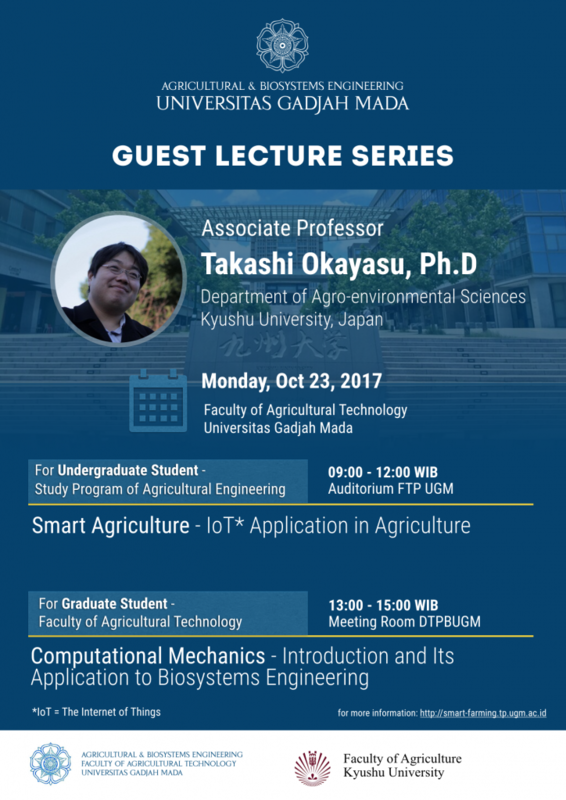 Guest Lecture Series by Associate Prof. Takashi Okayasu, Ph.D. from Department of Agro-environmental Sciences, Faculty of Agriculture, Kyushu University, Japan. This lecture is hosted by Department of Agricultural and Biosystems Engineering, Faculty of Agricultural Technology, Universitas Gadjah Mada under the International Networking Program. For Undergraduate Student – Study program of Agricultural Engineering. Lecture title: Computational Mechanics – Introduction and Its application to Biosystems Engineering. For more information regarding the topics, kindly visit smart-farming website.